The house, built in a former barn, is located 22 km from Florence, near the Castle of Nipozzano. In the Tuscan countryside, with olive groves, vineyards and woods. In the garden of 3000 sqm fully fenced there is a pool of 12x6 meters with Jacuzzi and system for swimming against the current. The swimming pool (depth from 1. 1 to 1. 4 meters) is rented along with the house in exclusive use (is not used by other guests, or by the owners). From the large terrace you can enjoy a wonderful view. The same from the edge of the pool, complete with a large terrace, covered dining area and barbecue. In the garden there are olive trees, fruit trees, an oak grove and a wonderful old oak tree. We loved our week in the Tuscan hills. The villa is much more spacious and impressive than the pictures suggest, there is plenty of living space inside, with a terrace outside as well as the seating areas by the pool. The house is well equipped, and the lovely owners left a welcome pack with food and drink for the first night and morning. My teenage son was happy with the WiFi, my daughter and I enjoyed the pool, tranquility and local wildlife. Florence is easy to get to by train. We did not venture out as often as it was too hot. The villa itself is at the edge of a forest on a hill, so temperatures felt cooler. There are only a few other houses around but none are overlooking the villa. The villa is at the end of a gravel road and easy to find thanks to Anna’s directions. I will definitely recommend this villa to friends and hope to come back one day to explore the rest of Tuscany. Superbe vue sur les vignes, la maison est très bien équipée. Très sympathique accueil de la propriétaire à notre arrivée. Grande piscine au milieu d'oliviers, impeccablement entretenue (quotidiennement) par Arnaldo. Florence et Fiesole sont rapidement accessibles. Sommes enchantés de notre séjour dans ce gîte. Dear Dominique, many thanks for your kind words! I’m very happy that you liked our house. I hope to have you soon again as our guest! 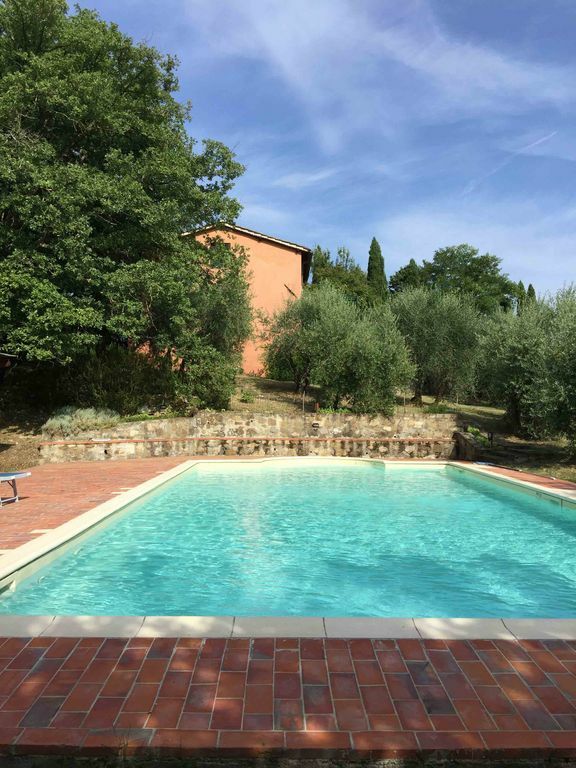 A tous les amateurs qui recherchent une villa de charme et équipée d'une piscine magnifique, bien utile après de longues journées de visite de cette Toscane si superbe. Vous trouverez ici un endroit magique au cœur des vignobles de Toscane avec une vue exceptionnelle sur la campagne environnante, une propriétaire sympathique et accueillante et une maison rénovée charmante et très bien équipée. A 20 kms de Florence, mais quel bonheur de se reposer dans cet écrin de verdure si reposant. A conseiller et merci encore à Anna. Unfortunately I don’t speak French, I only understand it a little, and I must answer in English. I wish to thank Laurent for his kind words. I’m very happy that he liked our house and I hope that he and his family will come soon again.